Mark Zuckerberg founder of Facebook is facing heat over a leaked Instant Message conversation dating back to 2003. It can be seen he is mocking users who join his social network, which was at the time call The Facebook, in which he operated from his Harvard dorm room. 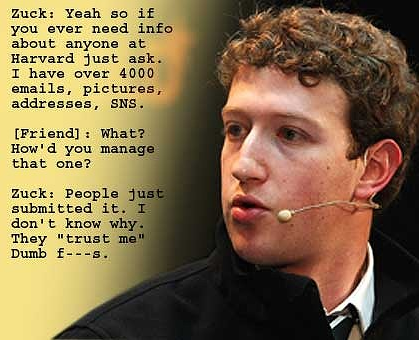 Zuck: Yeah so if you ever need info about anyone at Harvard. (Friend): What? How’d you manage that one? Zuck: People just submitted it. I don’t know why. There is no doubt the changes are being made for commercial reasons. The more private data publicly available and shared with commercial partners, the more profitable it is for Facebook. In the first quarter of 2010 Facebook has outstripped Yahoo in display ad impressions at 176 billion ad impressions to the US users. On the other end of the scale many are saying that Facebook is well in their means to make whatever changes they like to the site – aslong as users are given warning about how this affects their personal details – and Facebook has always throughly explained about any privacy changes.